Collagen and elastin are two proteins that help form the connective tissue in the skin. Collagen provides structure and strength while elastin provides flexibility and elasticity. Hyaluronic acid is the fundamental building block of collagen and allows the cells to retain moisture. We gradually produce less of all these beginning in our 20’s. The result is loose skin, lines, wrinkle formation and dryness. Cell turnover slows and it takes longer for dead cells to shed from the surface of the epidermis, adding to the appearance of lines and dryness. It also contributes to dull, devitalized skin. The lymphatic system becomes sluggish. Since this is the body’s waste disposal system, it’s ability to remove metabolic waste, toxins and free-radicals is diminished. This inhibits your skin’s immunity to the environment as well. There is a gradual breakdown of the protein “glue” that holds the epidermis to the dermis, and we begin to notice the ‘slip’ in our facial structure. Finally, the subcutaneous or fatty layer of the skin thins, resulting in hollows and more prominent appearing cheek bones. A clear example of this is the thin skin on the hands of an elderly person. Sounds dire, yes? The good news is the cells have great memory and just need the proper care and stimulus to produce like they used to. Simply put, Chronological age is your number in years, Biological age is your age at a cellular level. While the years march on, your biological age is affected by genetics (out of your control), environmental factors (somewhat in your control) and lifestyle (totally in your control). So, how do you manage the progression of your biological age? Let’s explore culprits and solutions. 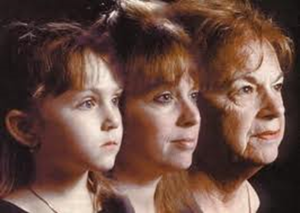 Genetics play a big role in the rate of aging of your skin and how it ages. These may include dark circles under the eyes, droopy eyelids and jowl formation. Let’s not forget genetic predisposition for skin conditions such as rosacea and growth of ‘barnacles’. While genetics predict how we age, we at youbaby have many options on how to minimize these changes. FotoFacials are a very effective way to manage redness and create a more even skin tone. Skin tightening with ReFirme helps control the sagging and increase collagen production. Tissue activation and collagen induction with META Therapy helps to improve elasticity and firmness. Genetic ‘barnacles’ can easily be removed with a mild electrical current, resulting in clear, smooth skin. PICO Genesis restores a beautiful skin texture, even skin tone and a fabulous glow. Environmental factors that influence the rate of skin aging are sun damage, HEV’s, toxins and free-radicals. Sun exposure without protection is the number one cause of premature wrinkling, brown spots, uneven skin color and of course, skin cancer. UVB’s are the burning rays and UVA’s are the deeper, more damaging rays. Sun damage is cumulative and progressive, beginning with our very first sunburn. It does not become visible for many years. Examination by a Woods Lamp (black light) reveals what is yet to come. Environmental toxins and free-radicals speed the aging process by causing oxidation (think iron rusting), cellular breakdown, mutation and compromising the immune function of the skin. While environmental factors can ravage the skin and create premature photo-aging, you can correct much of that damage with PICO Genesis, Laser Spot treatment, FotoFacials, META Therapy and ReFirme. In addition, you can prevent future damage with consistent use of antioxidant products such as the new Revision C+, DEJ Face Cream (day and night), and DEJ Eye Cream. And, of course, the regular use of sun protection clothing, hats and appropriate sunscreen such as Intellishade, Intellishade Matte, Intellishade TruPhysical (all SPF 45) and Multi-Protection SPF 50 Moisturizer. Lifestyle factors that influence skin aging are smoking, drugs (prescription and recreational), poor nutrition, lack of sleep, stress, improper skincare and lack of exercise. In our recent blog about causes of wrinkles, we discussed smoking as a major factor in premature aging link to blog. 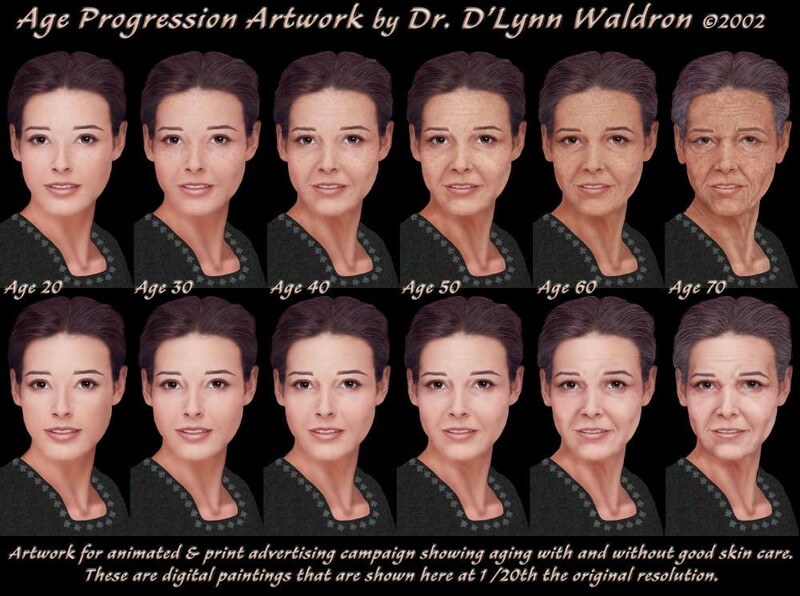 This computer-generated photo shows age progression of a smoker vs non-smoker. Need we say more? Lack of sleep and stress can cause premature aging of the skin. Stress increases cortisol production that when prolonged may result in high blood pressure (redness in skin), high blood sugar, loss of muscle mass (sagging skin and loss of underlying structure) and compromised immune function (lymphatic involvement). Lack of sleep increases stress, creates dark circles under the eyes, and impairs the regenerative processes that occur during sleep. Poor nutrition means unhealthy cellular function throughout the body and will show up in the skin. Some symptoms are non-hormone related acne breakouts, blotchiness and redness, rashes, sallow color, grainy texture, crepey skin, and dryness. Truly, we are what we eat, and our skin cells function accordingly. Healthy food = healthy body and healthy skin. Junk food = unhealthy body, inflammation and compromised skin. Lack of exercise means loss of muscle mass and tone in the entire body. This compromises the integrity of the underlying structure of the skin resulting in sagging. Exercise is also paramount to healthy lymphatic function. Last, but certainly not least is the subject of home care. Proper home care for your skin type is critical to a successful age-management program. You can see from the following illustration the difference in age progression with and without a proper skin care regimen. (link to last blog). At youbaby we design a specific home care regimen just for you with the most effective and cosmetically elegant product line we have ever used – Revision Skincare. In review, this is your checklist for the healthy, beautiful aging of your skin. Just keep in mind that the health and beauty of your skin is a direct reflection of your internal health. Protect yourself from the sun by wearing protective clothing and always use a sunscreen. I know, you’ve heard it all before. There’s a reason for that! It’s because it’s true!